By Isabelle Corvin, CG, Staff Gemologist at Panowicz Jewelers. Pantone has officially announced it’s 2019 Color of the Year as “Living Coral” (16-1546)! This bold, energetic, and dynamic color is sure to liven things up for the New Year! Pantone calls Living Coral “sociable and spirited” and says that it is a nurturing color. It’s a blended hue of orange and pink, creating a bright spot in our everyday lives. The first known written use of the word “coral” to describe a color was in 1513, and the use of “coral pink” was in 1892. The term “coral” for color has been used to described reds, oranges, and pinks, as well as mixed colors from those components. Cheerful and shocking, coral lends itself well to all aspects of décor, graphic design, and fashion. 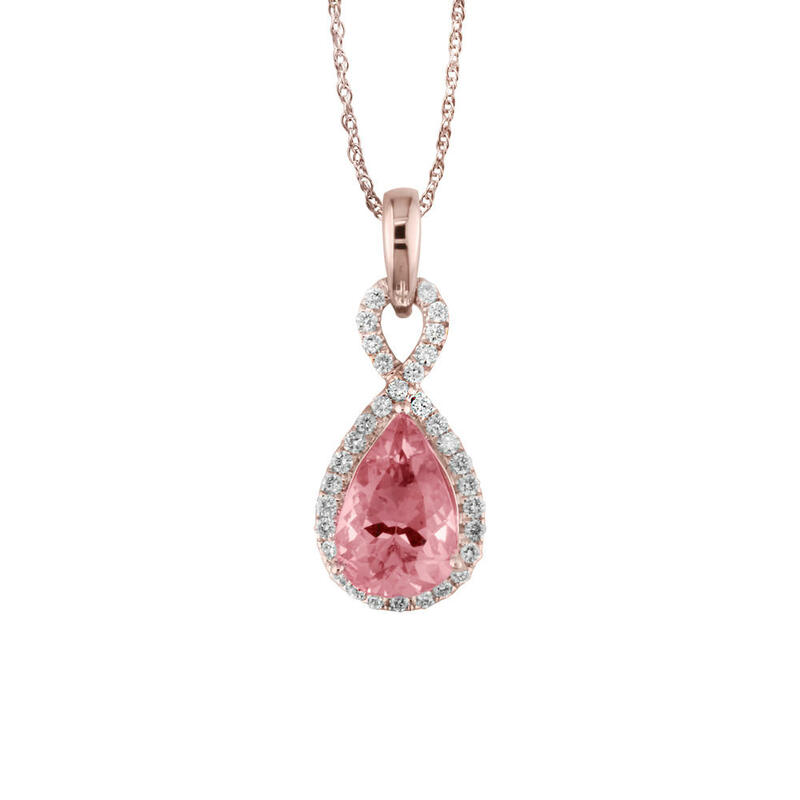 In fact, you’ll find several gemstones that display this bright, bold, and beautiful color! Padparadscha sapphire and Rhodochrosite match Living Coral almost perfectly, with their lively blend of just the right amount of pink and orange. 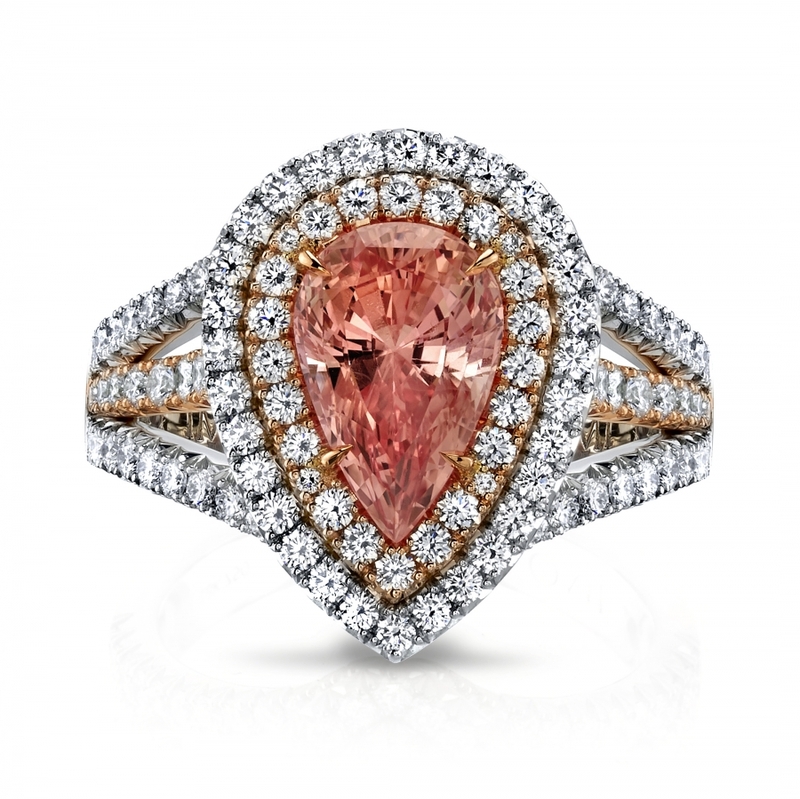 Padparadscha sapphire and diamond ring, by Omi Privé. 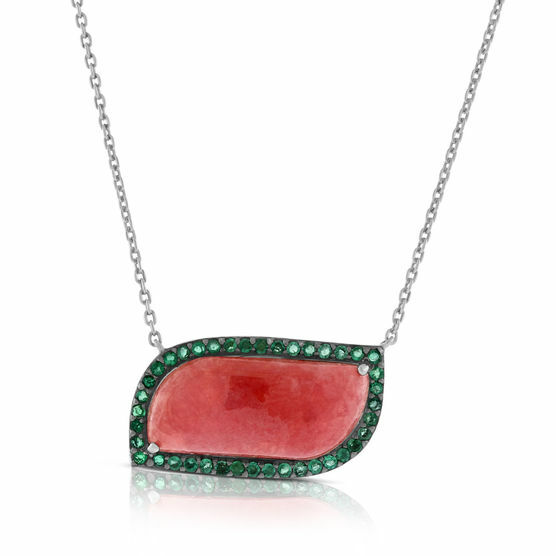 Rhodochrosite & Emerald Necklace, from the Lisa Bridge Collection at Ben Bridge Jeweler. 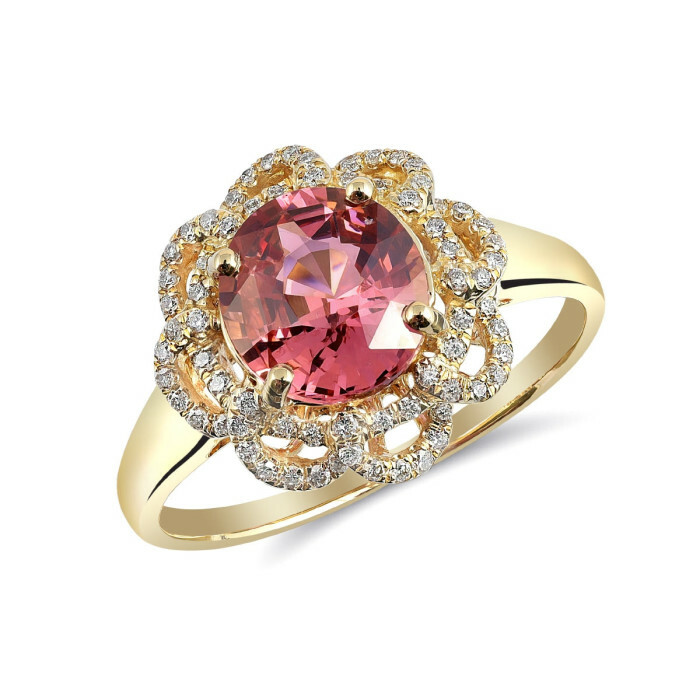 Padparadscha is a high-energy stone with an exotic look. The name comes from the Sanskrit word for “lotus.” And indeed, some lotus blossoms exhibit Living Coral excellently! Rhodochrosite embodies the feeling of Living Coral with its color and the belief that it is a powerful stone for opening your heart once more. It is said to heal emotional wounds and be a guide for finding love. Other gemstones that depict shades of Living Coral are additional sapphire colors, and some hues of topaz and spinel, as well as certain garnets. Pink spinel and diamond ring, by JupiterGem. Lotus garnet and diamond pendant, by Parle Gems. Living Coral reminds us that the world around us is alive, filled with wonder and magic, if we only take a few moments to look. The color dives deep into our hearts, beckoning an appreciation for life’s moments and worthwhile memories. According to Pantone, they chose this color for that very reason. In a world so immersed in technology, we all seek connections. Living Coral is a delight to the eyes and a light to the heart. Jewelry images by credentialed AGS members. Visit ags.org/findajeweler to find an AGS jeweler near you. Isabelle Corvin is an AGS Certified Gemologist (CG) who is the Staff Gemologist at Panowicz Jewelers. Since she was 14-years-old, she knew she wanted to be a gemologist. Ms. Corvin also writes for Panowicz Jewelers’ blog. As thoughts of summer vacation drift through our heads, so does the ultimate question: “What am I going to pack? !” Whether you’re traveling overseas, across states—or even planning a staycation—it’s good to have a plan. Although we’d love to help you pick out your various outfits and toiletries—they aren’t our area of expertise. But we CAN give you some great ideas on what jewelry to bring with you. It’s often a challenge deciding which items of jewelry to take, depending on the outfits you pick. But it’s important to note that it’s best to leave the most valuable and delicate pieces at home. Before you pack, we have this recommended read from Jewelers Mutual Insurance Group: The Pocket Guide to Traveling with Jewelry. Yet, no outfit is complete without the punctuation of fine jewelry. Here are five pieces from a few of our AGS members that would make great travel companions! Click on the images below to get a closer look. 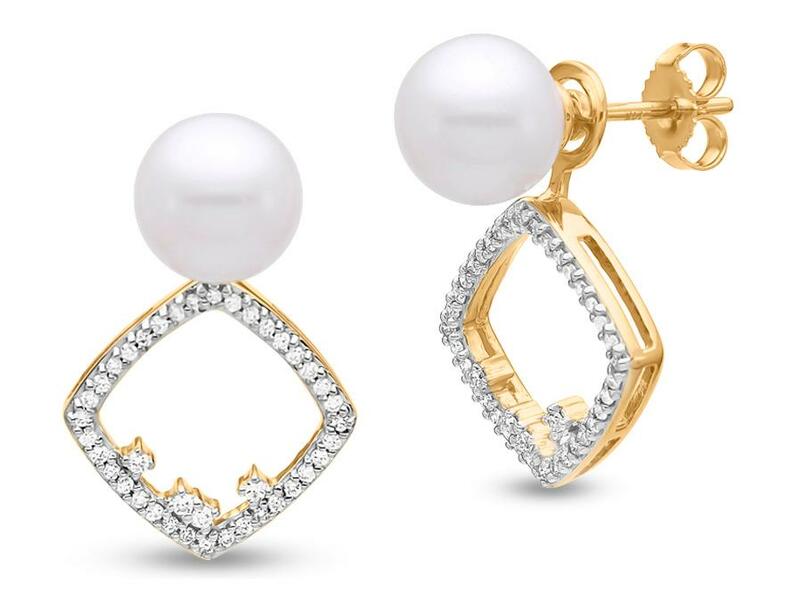 “Caprice” multiway diamond eclipse earrings, by Mastoloni. When you can bring one pair of earrings and wear them three different ways, you’re covered! 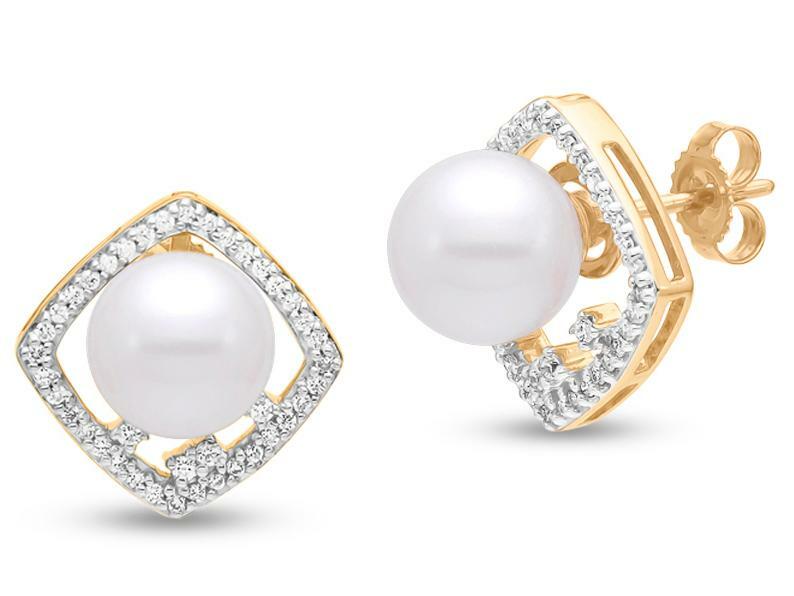 Wear as a dangle, as a diamond and pearl stud, or wear the pearl by itself. 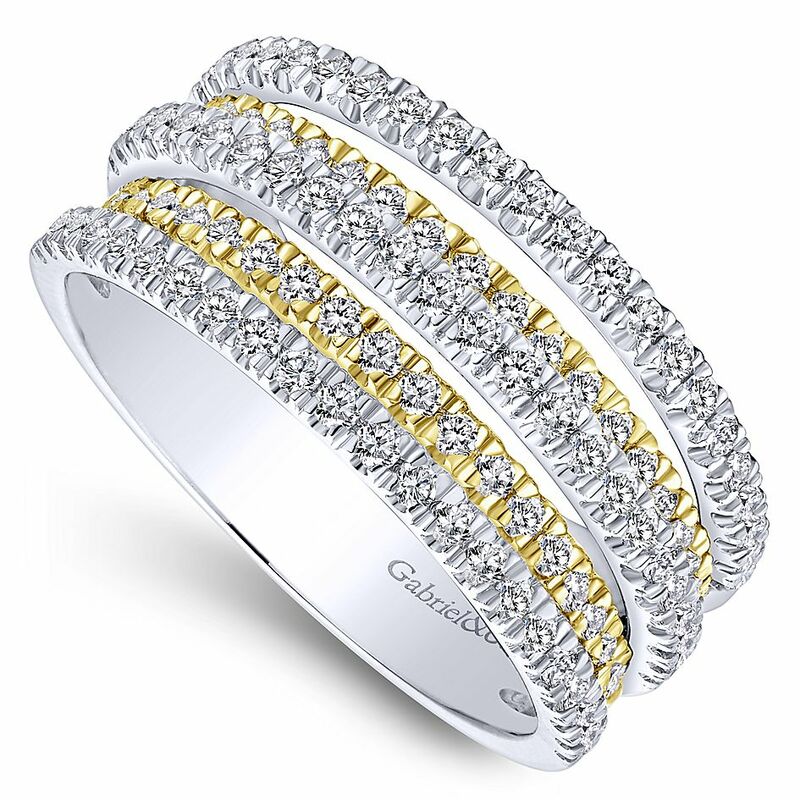 Wide diamond band from Gabriel & Co. “Lusso” collection. A diamond band with alternating 14k yellow and white gold gives the illusion of wearing multiple rings. Easy peasy! 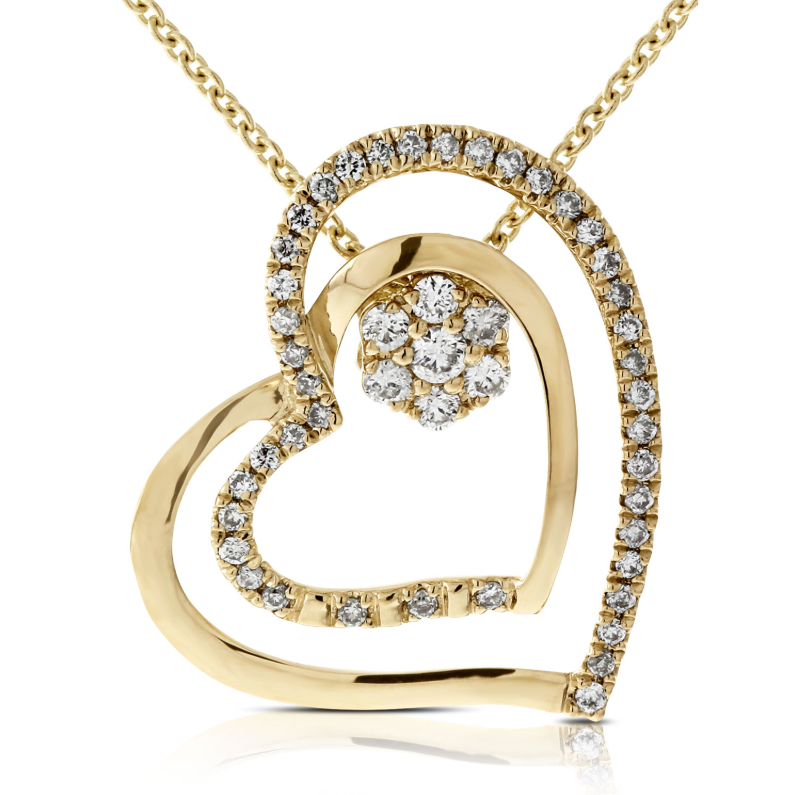 Two-piece convertible diamond heart pendant, by Lisa Bridge, Ben Bridge Jeweler. 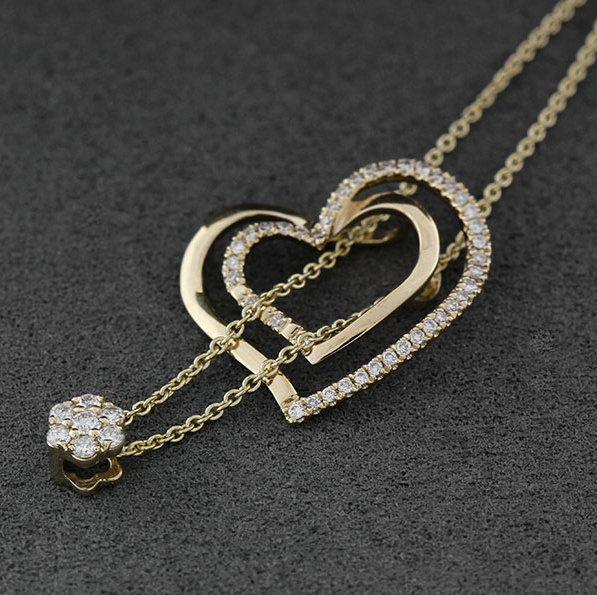 This romantic pendant is convertible and can be worn three ways: with both diamond pavé and heart pieces together, or either the center circle or heart frame separately. 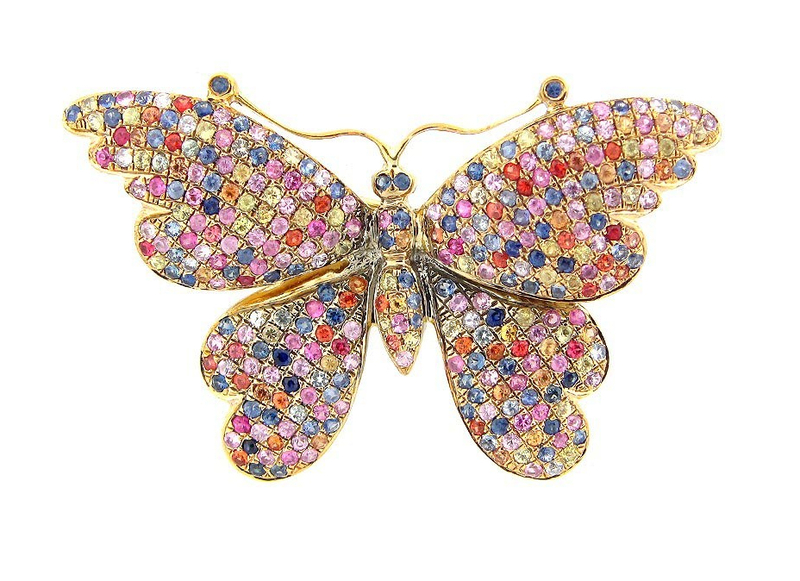 Rainbow sapphire butterfly brooch, by Dilamani. A brooch you say? You bet! Dress up any top, scarf, hat—or even a hairstyle—with a brooch. A brooch can also be turned into a pendant with the addition of a chain. So many style options! 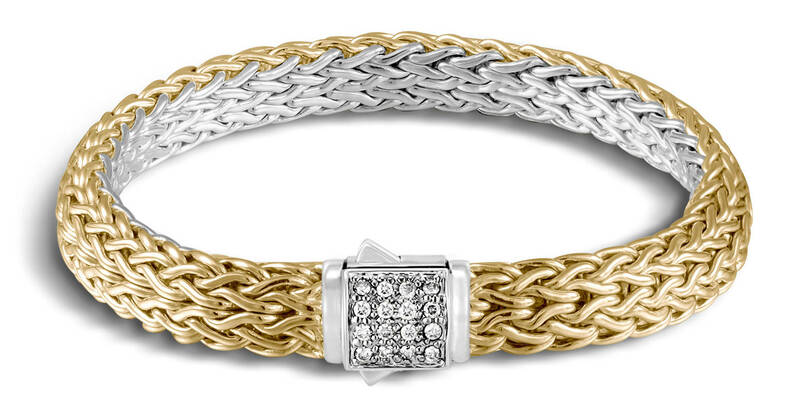 Custom reversible classic chain bracelet, by John Hardy. Here’s another “gem” we found: one bracelet with two looks! John Hardy gives you the opportunity to customize your own chain bracelet with any gemstone look. Below is the combo we designed. The 18k bonded gold side sparkles with diamond pavé. 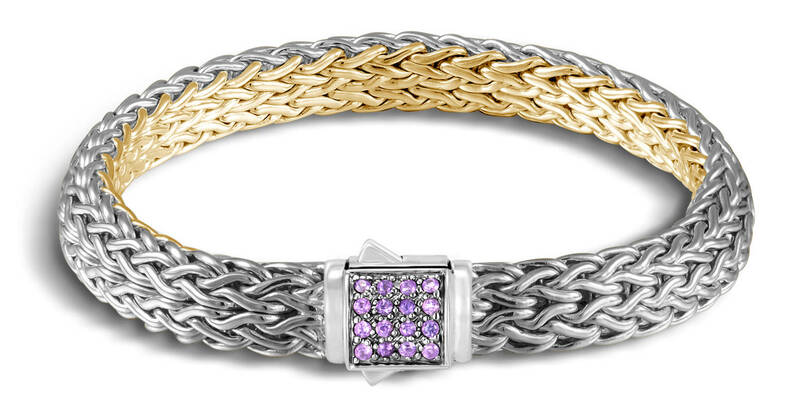 The sterling silver side has a pop of color with amethyst. Which look would you create for yourself? Visit an American Gem Society jeweler near you for more helpful hints on what to bring—and what not to bring—on your summer vacation. Happy travels! It’s been a year since spinel was added to August’s birthstone line up. Those celebrating a birthday during the eighth calendar month now have three gemstone choices: peridot, sardonyx, and spinel. Blue spinel by Gem 2000. For those who are still unfamiliar with spinel, it is often assumed to be other gemstones, like ruby or sapphire. Cobalt blue, like the one above, is one of the most desired colors. But it can be found in a variety of colors, such as the much coveted red, as well as black, violet blue, greenish blue, grayish, pale pink, mauve, yellow or brown. Spinel can also be found in various cuts, like octagons, trillions, squares, rounds and fancy shapes, like ovals, pears, and cushions. No matter what the shape, spinel is spectacular! Take a look at these designs by our AGS members. Click on the images for a closer view. 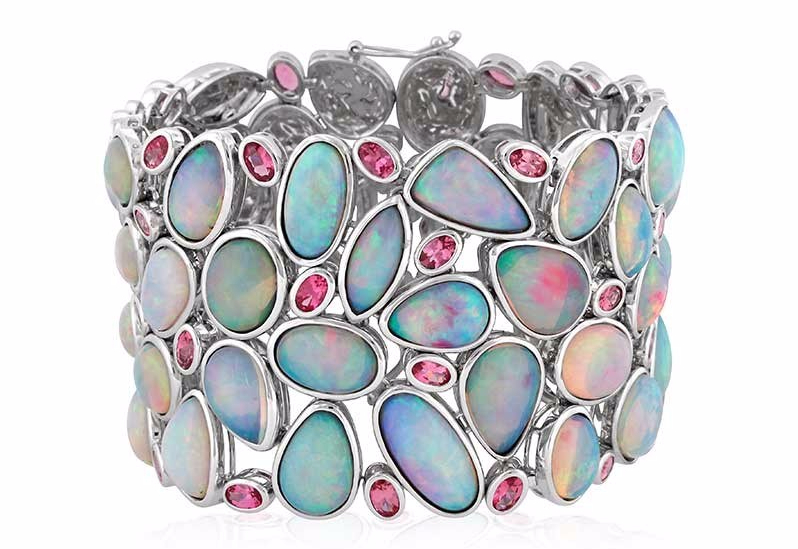 The Kalmia bracelet by Yael Designs features opal cabochons accented with pink spinel. Affinity bracelet by Coffin & Trout Fine Jewellers, featuring multi-colored spinel and round brilliant cut diamonds. 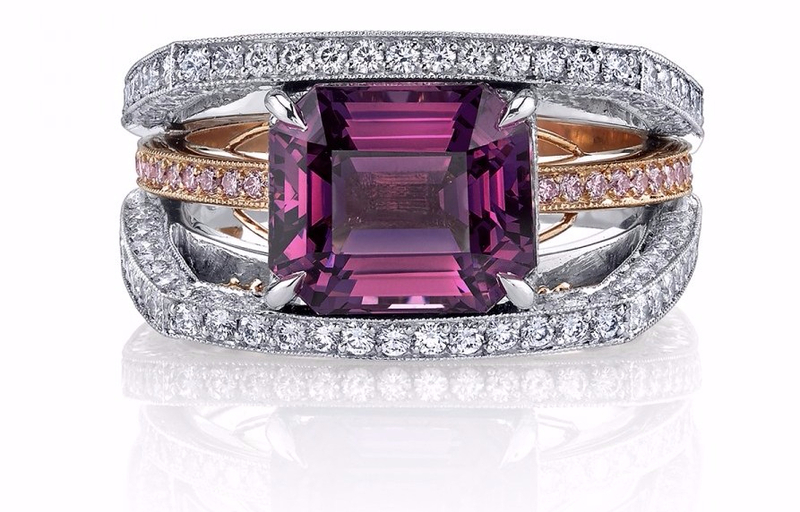 Emerald cut purple spinel, pink and white diamond ring by Omi Prive. 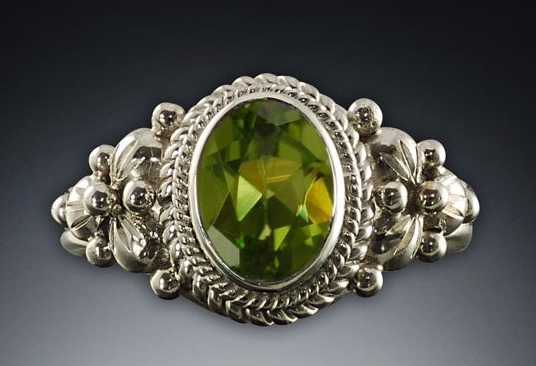 The verdant peridot is the gemstone most commonly associated with August. Peridot’s recognizable green hue could sometimes vary from yellowish-green to olive to brownish green, contingent on how much iron is present. Yet the finest peridot is a brilliant green without any hints of brown or yellow. 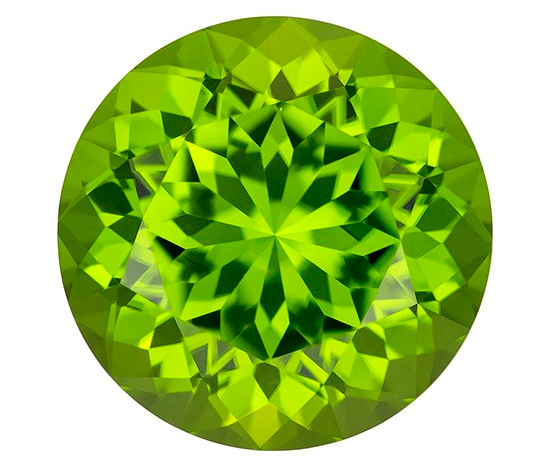 Our AGS members will help you find the perfect peridot for you! Click on the images for a closer view. 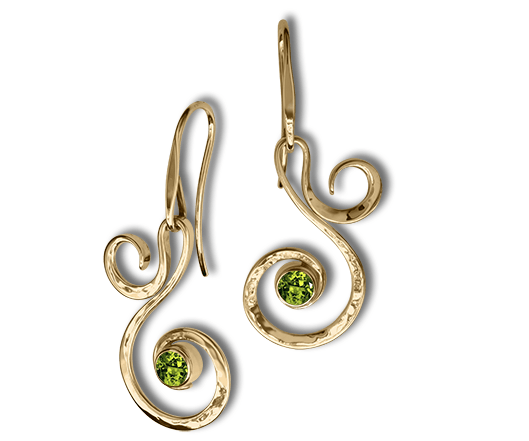 Hand-hammered Fiddlehead earrings by Ed Levin Jewelry featuring peridot in the center. Peridot and sterling sliver ring by Michael Schofield & Co. 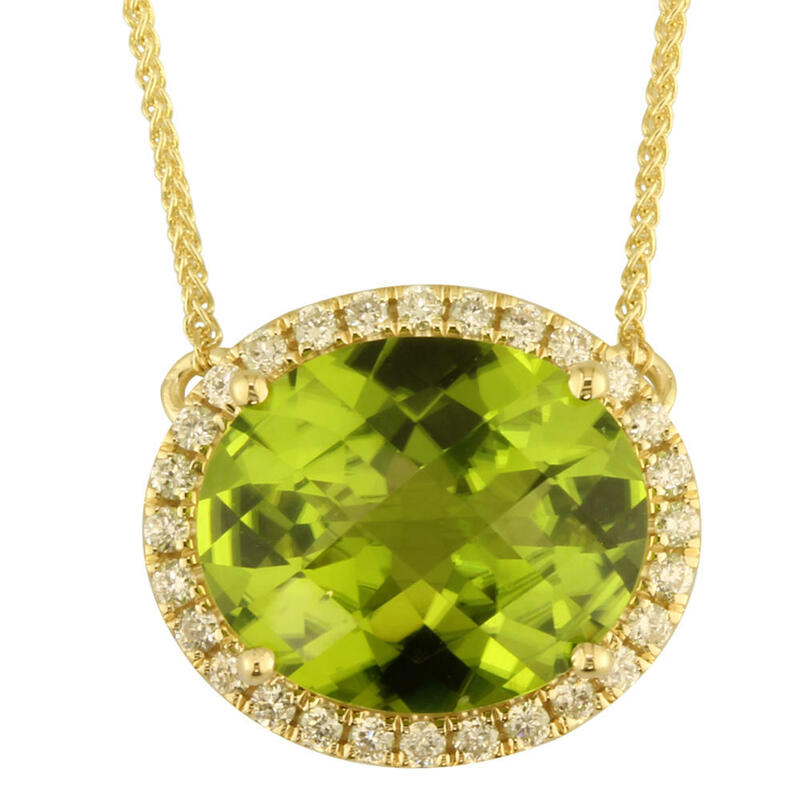 Oval checkerboard peridot and diamond neck piece by Parle. 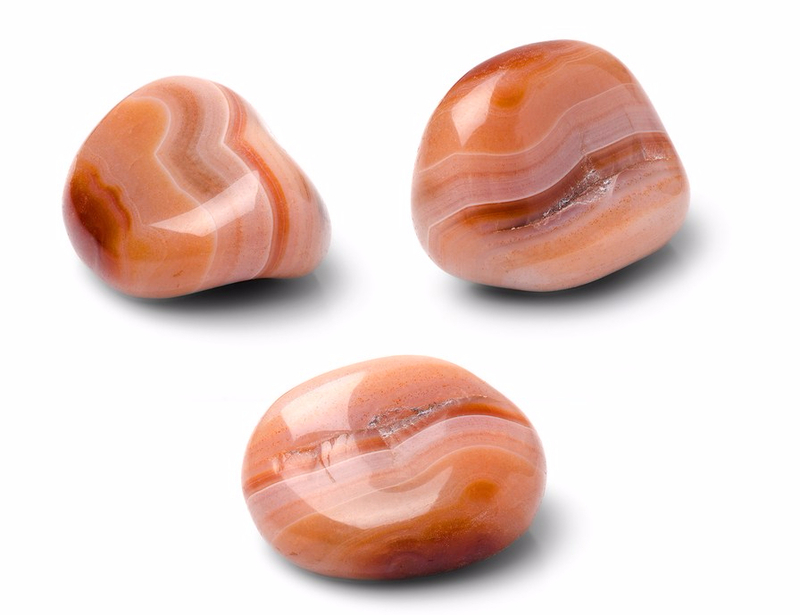 Since as far back as Roman times, sardonyx has been highly valued as a stone representing strength, courage, happiness, and clear communication. The unique reddish, zebra-striped banding of sardonyx stands out beautifully when the stone is smoothed, so it is often cut in cabochon and worn as beads or featured in an eye-catching pendant or ring. Sardonyx makes a great gift for those born in August who want something a little different than the traditional birthstone. Readily available and relatively inexpensive, sardonyx makes an affordable addition to anyone’s collection. If you’d like to add spinel, peridot, or sardonyx to your jewelry wardrobe, contact a credentialed AGS jeweler near you! December’s birthstones offer three ways to fight the winter blues: tanzanite, zircon, and turquoise—all of them, appropriately, best known for beautiful shades of blue. 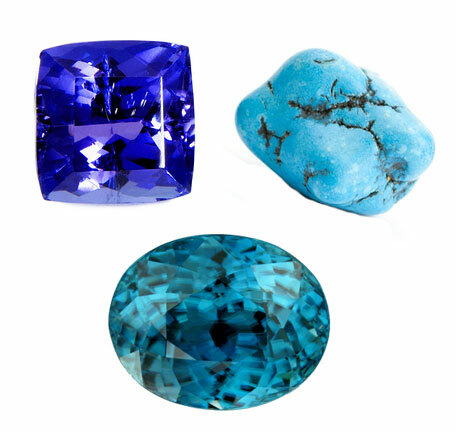 These gems range from the oldest on earth (zircon) to one of the first mined and used in jewelry (turquoise), to one of the most recently discovered (tanzanite). Below is a collection of beautiful blues designed by our AGS members. Click on the images to see all the beautiful details! 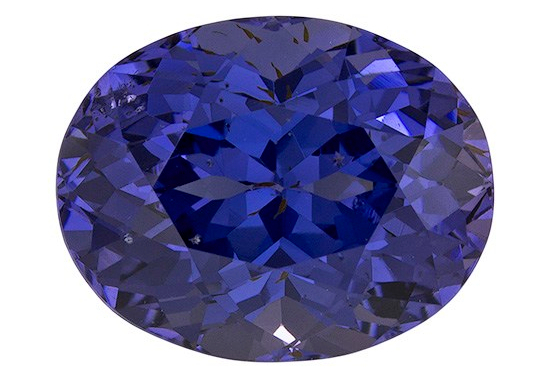 Due to pleochroism, tanzanite can display different colors when viewed from different angles. Stones must be cut properly to highlight the more attractive blue and violet hues and deemphasize the undesirable brown tones. The majority of tanzanite on the market today is heat treated to minimize the brown colors found naturally and to enhance the blue shades that can rival sapphire. Between its deep blue color and its limited supply, tanzanite is treasured by many—whether one is born in December or not! Pear shaped tanzanite earrings by United Color Gems. Carved tanzanite ring by Goshwara. Tanzanite and diamond ring by Erica Courtney. Zircon is an underrated gem that’s often confused with synthetic cubic zirconia due to similar names and shared use as diamond simulants. Few people realize that zircon is a spectacular natural gem available in a variety of colors. Zircon commonly occurs brownish red, which can be popular for its earth tones. However, most gem-quality stones are heat treated until colorless, gold or blue (the most popular color). Blue zircon, in particular, is the alternative birthstone for December. Whether you’re buying blue zircon to celebrate a December birthday, or selecting another shade just to own a gorgeous piece of earth’s oldest history, zircon offers many options. Blueberry Zircon™ by Le Vian. Custom cut blue zircons by Simone & Son. Blue zircon and diamond pendant by Yael Designs. Turquoise, the traditional birthstone of December, is also gifted on the 11th wedding anniversary. But buying turquoise doesn’t require special occasions; its namesake blue color has been internationally revered for centuries as a symbol of protection, friendship, and happiness. Thanks to its historical and cultural significance in many Native American tribes, turquoise remains most popular throughout the southwestern U.S.—which supplies most of the world’s turquoise today. Turquoise is one of few gems not judged by the 4Cs of diamond quality. Instead, the main factors that determine its value are color, matrix, hardness, and size. The most prized turquoise color is a bright, even sky blue. Greenish tones can lower the value of a stone, although some designers prefer it. Because of its fragility, turquoise is often treated to enhance durability and color. Some treatments involving wax and oil are relatively harmless, while other methods—including dye, impregnation, and reconstitution—are more controversial. Seek out an AGS jeweler who can help you find the best quality turquoise. Turquoise and black sapphire ring by Lisa Bridge Collection. Arizona turquoise bead and sterling silver necklace by John Hardy. Mexican turquoise and champagne diamond pendant by Lika Behar Collection. Shopping for fine jewelry should never make you blue! Make sure you shop with a trusted jeweler and buy it with confidence. Click here to search for an AGS jeweler near you. Gemologist and designer, Lisa Bridge, has been around fine jewelry and gemstones her entire life. As a fifth generation member of the Seattle-based Ben Bridge empire (70 stores and counting across the United States! ), she knows a thing or two about what kind of accessories women want to wear, and luckily enough, she has the right connections (wink, wink) to design her version of statement jewelry at accessible price points. We spoke to Lisa about how her collection came to be, and what’s next for the brand. Jewelry is definitely in your blood. What is it like to be a fifth generation jeweler? It is a tremendous joy to have spent my life dreaming of jewelry! Growing up, it was what we talked about around the dinner table and our spring break trips were spent visiting stores. Being in business with my family is wonderful, I get to learn from them and share in the business that they have built. Why did you decide to earn your gemology degree and move into design? I believe in professionalism and I knew that I needed the best knowledge to achieve it. I sought my gemological titles to gain a base of knowledge that I am constantly building upon. 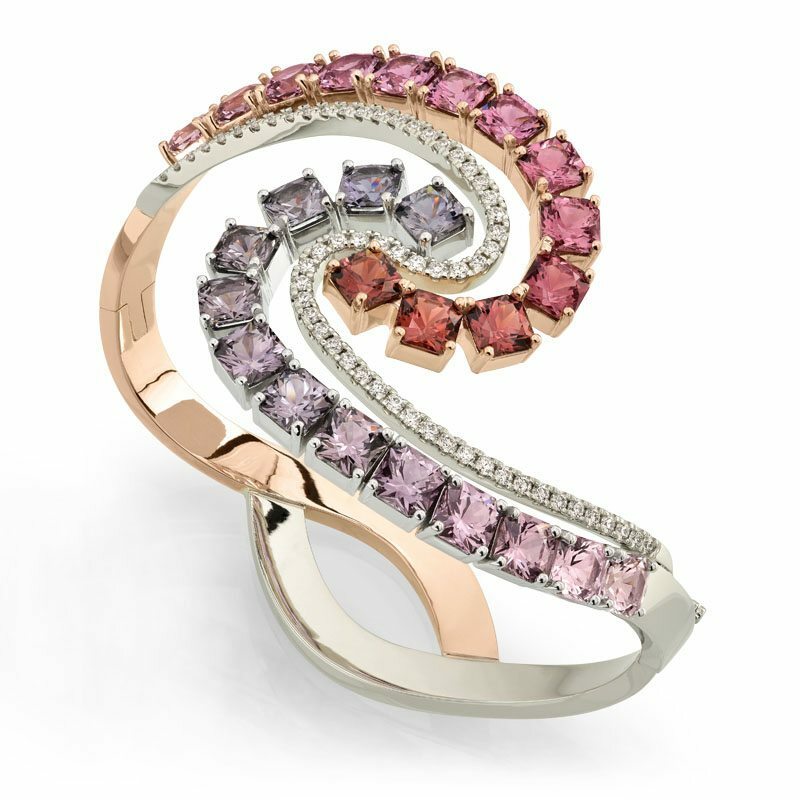 Your collection uses gemstones in 14k gold and silver. What is your design process like and what stones and silhouettes are you loving right now? Every piece of jewelry has a different journey. Sometimes I am inspired by a particular stone – for example, I found a wonderfully shaped piece of lapis in Tucson last year. It was almost a guitar-pick shape. I took that piece of lapis home and stared at it dreaming of what it could become. I designed a suite of jewelry using this unusual shape and customers have really responded to it! The other way I find inspiration is in experiencing incredible places. I love gazing at a beautiful vista of mountains, trees, and water. I find ideas in the shapes and colors that I see. Traveling is one of my favorite things and now trying to capture the essence of amazing places is a delicious challenge! What have the reactions from your customers been to your line? I feel deeply gratified that customers have embraced the collection. I am encouraged by people who come back to purchase a second or third piece having loved what they already have. Having my creations become part of people’s lives is truly a wonderful gift. What’s next for the LB collection? I am excited to be introducing a new collection this fall full of new inspiration, colors, and gemstones! Shop the Lisa Bridge for Ben Bridge collection right here.